Volvo Car Corporation has been in the car building business for a long time. This Swedish company was founded in the year 1927, in Gothenburg, Sweden, to be precise. Since then, Volvo cars have been a benchmark in the entire car industry for their safety. Volvo is known for its high safety standards on their cars. 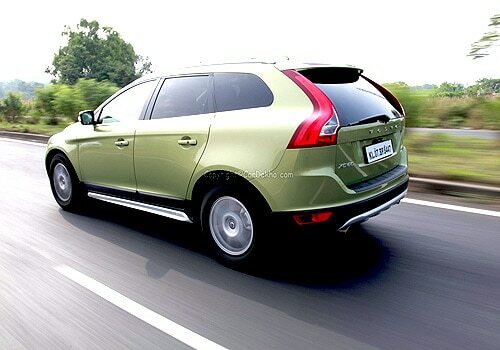 Volvo India has lately got aggressive and has lined up a few cars for the Indian market. The Volvo XC60 Diesel, that was launched recently is the first from the rejuvenated Swedish auto maker. Let’s find out more on this SUV which is the safest Volvo ever. If you want me to describe the Volvo XC60 Diesel in two words, then here they are – 'Complete Headturner'. Yes, the Volvo XC60 is a remarkably beautiful vehicle. SUVs are known to be aggressive and mean looking but this one’s got all the chic looks. A smart looking front which reminds you of the Volvo family especially the big brother, the XC90 with a large bonnet and the family Volvo grill with all the chrome inserts on it and the flushed self-leveling xenon head lamps, neatly integrated turn lights in the headlamp assembly and a smart looking slanting white line type fog lamps placed just next to the headlamps on either sides. Huge body colored bumpers in the front with silver colored skid plates bring in the sportiness on the front. The lower part of the bumper in Volvo XC60 Diesel is kept black cause this is the area that receives the most of the slush, dirt, rocks etc that it may hit into while off roading. The sides are full of muscular wedges and the highlight on the sides is the high waistline that runs back till the tail lamp which is a very different style. Huge doors and dark black tinted rear glass on all the windows except the front windows looks very nice. Auto folding and electrically adjustable wing mirrors with neatly integrated turn lights on them look ravishing. The Volvo XC60 Diesel is a smart looking crossover from any angle you view it, but the beauty lies in the boot. This is the best part of the Volvo XC60 where the waterfall designed LED tail lamps that are neatly flushed into the body design while neatly mating with the waist line that travels from the front creating a type of a semi curve at the rear make it the best rears of any SUV- Crossover that I have seen on Indian roads so far. The rear bumper in the Volvo XC60 Diesel is huge and in the same duotone fashion as the front bumper; dual exhaust tail pipes also help in adding a lot of sportiness at the rear. The tail gate can be opened electrically and also closes automatically at the press of a button on the boot lid. The Volvo XC60 Diesel glides on rubbers that are of 17 inch 235/65R on 6 spoke silver alloys with XC inscribed on the alloys as well. The Volvo XC60 has the panoramic sun roof and silver roof trails with a fish tail antenna that enhances the top of this good looking crossover. If you thought that Volvo only made boxy looking cars then you would regret you ever believed that after seeing the Volvo XC60 Diesel. Its got the drop dead gorgeous looks that can give any German or Japanese SUV the run for their money well it looks better than any of the other SUV in its competition currently. The paint quality, fit finish and weld on the outside is top class and up there in the leagues of the Germans. Doors shut and open with precise thud and there is a rather European feel all over the Volvo XC60 Diesel. The goodness of the outside extends in the Volvo XC60 Diesel cabin as well. Strikingly differently appointed cabin is what you see at first glance. Two tone leather seats in dark brown and cream with very different head rests on the front seat. The front seats are electrically adjustable for reach, backrest and height and have lumbar support as well. Comfort level is pretty high on the front seats while the rear is a bench type 40-20-40 split seats which is also pretty good and comfortable. Leg room and head room is at loads in here. The rear seat can comfortably seat 3 adults if the centre arm rest is folded back into the seat. While the dash is made of rubbery material found on the German cars, it was interesting to learn that Volvo was the first company to use such type of soft rubbery material on dashboard in the year 1960. The floating centre panel in the Volvo XC60 Diesel is something not found in other cars. Behind the centre console, is the storage space and hence it’s called as floating centre console and is always a trademark styling in many newer Volvos. The Steering is manually adjustable for height and reach and has a very good feel when gripped and real metal is used as inserts on the steering and on the centre dash. Instrument cluster in the Volvo XC60 Diesel looks very different with a LCD display within the twin round Speedo and RPM dials. The plastic quality and quality of the switches and door handles is top class and everything in here works well and feels as if they were hand crafted. Garmin GPS system is standard and is one of the best live GPS systems I have used so far. The floating centre console houses the CD changer under which is the phone/radio buttons and then the different looking climate control section. The centre console is slightly tilted towards the driver’s side making the driver feel special. The Auto gear shifter also gets the leather surrounds; the Volvo XC60 Diesel has an auto 6 speed shifter and also the option of Tip-tronic mode where the driver is in control of the shifts. The rear passengers are not left out in the entertainment department and get two 7 inch LCD screens that are planted behind the front seat headrests, these screens have DVD players built in them and also come with 2 wireless headphones, now that’s what I call being 'spoilt for choice' Audio and video quality is top class and one also has a remote control to control the entertainment proceedings in here. The Volvo XC60 Diesel gains from a 8 speaker Dolby Pro Logic 3 Channel surround system that is of high quality and also has an USB and a AUX input to connect your I-Pod or a Flash drive. The rear camera is sharp and very helpful while backing up. The climate control can go down to 13 degree, now that’s cold. There’s also a choice of wood trim in place of the metal trim as desired. If it’s a Volvo, it has to be the safest. The Volvo XC60 Diesel has all the typical Volvo safety features and lots more - whiplash protection system, side impact protection system, roll stability control, dynamic stability and traction control, inflatable curtain airbags, hill descent control, collision warning with brake support, active bi-xenon lights that turn in the direction of the steering, all around body shells that make the Volvo XC60 Diesel passenger compartment safest for rear occupants. If you want more, then there is the Collision Warning System combined with the Auto Brake system on the option list. When this system is active the driver is warned when the vehicle ahead of the Volvo XC60 Diesel reduces its speed via a red flash light that’s projected on the driver’s side of the windshield combined with an audible tone. Adaptive Cruise Control is also a very advanced system that works with the help of the laser that keeps checking the distance of the vehicle driving ahead and takes note of any change in the distance. Then there is the City Safety system that is the world’s first auto braking system where if the system is active and the Volvo XC60 Diesel is under 30kmph of speed and the driver forgets to apply the brake and something comes in the way, the laser beams detects the obstacle and applies the brakes on its own. This is a world's first and patented safety technology developed by Volvo and used for the first time on a Volvo car, on the Volvo XC60 Diesel. With so many safety features the Volvo XC60 has got the 5 star rating in the Euro Ncap safety ratings. With a long list of safety features that include many that are industry's first and are not seen on any other car make, the Volvo Volvo XC60 Diesel the safest car on Indian roads currently. For India, Volvo has plunked its renowned D5 Twin Turbo Diesel engine on the Volvo XC60 Diesel. This 2.4 litre D5 engine has 205Hp @ 4000rpm of power on the tap with 420Nm of torque between 1500-3250 rpm to play with. The D5 engine features a Twin Turbo along with Piezo hi-pressure injectors that feed the 5 cylinders on this unit. The D5 engine is a smooth operator and has a very unique firing coming from the 5 cylinders working in tandem. As mentioned the Volvo XC60 Diesel comes with a 6 speed steptronic gearbox; the power is transferred to the all wheel drive (AWD) system and the Volvo XC60 Diesel glides forward in refined style. The turbo lag is not felt and the D5 engine is very responsive, the Volvo XC60 Diesel is a driver oriented vehicle that one can have fun with, while driving and can be driven hard. The unique chassis and advanced features like the Roll Stability Control and the Continuously Controlled Chassis Concept (Four-C) make the Volvo XC60 Diesel feel like a high end sedan. The Volvo XC60 Diesel loves to be put into corners and this is where you realize what safety in a Volvo really is. The AWD is very intelligent and while off roading it balances the power to each wheel in accordance to the terrain and inclination. The feedback on the steering is very crisp and the Volvo XC60 Diesel begs to be driven hard. The driver can also preset the ride quality and choose between 'comfort' 'sport' and 'dynamic' mode at a gentle press of a button to suit your driving style and need. The Cabin is super silent while the engine is super refined. Top class ride quality and precise handling are the Volvo XC60 Diesel's strong points. The Volvo XC60 Diesel can be a able city runner and when needed can do a cross country without a hiss and yes it’s a good off roading machine too. Volvo cars have always been known for their safety features, off late, Volvo is marketing its cars very aggressively and is taking the Indian market seriously. With the launch of Volvo XC60 Diesel, Volvo is rejuvenated and ready for the long innings in India. The Volvo XC60 Diesel has loads of gadgets and safety features that help tilt the balance in its favor. Further more, the Volvo XC60 Diesel is a very good looking cross-over and with prices starting at Rs. 39.5 lakh (Ex Delhi), the Volvo XC60 Diesel sure is an irresistible offering from the Swedish car maker.